LOS ANGELES—Kamala Harris's effort to rebrand herself as one of the cool candidates running for office didn't begin with the Monday release of her "Mood Mix" video of her favorite songs. It began with her book tour. Each of the four book events last week began with California’s Democratic senator dancing onto the stage with Tupac's "California Love" exploding through the speakers. The events, in the liberal cities of Washington D.C., New York, San Francisco, and Los Angeles, are a clear warm-up act for her presidential run. But the goal at the events wasn't to go after President Donald Trump—her goal was to open up personally, reintroducing herself to voters as somebody she hopes they can relate to. At her final event in Los Angeles on Sunday, she managed to avoid uttering Trump's name altogether. The event was about Harris learning to "talk about herself," which she said was something she hasn't been accustomed to doing before her book, The Truths We Hold. Making it easier for Harris to talk about herself on Sunday was her host, Cleo Wade. The poet began the interview by telling Harris she was her "North Star in our nation's capital," and later gushed, "Whenever I'm in your presence, all I think of to myself is, ‘Who made her?'" Wade avoided any questions on policy, instead choosing to focus on the personal parts of the new book. Anecdotes about Harris's upbringing in Oakland, her time going to parties as a student at Howard University, and how she met her husband Doug Emhoff on a blind date fill the hour. She says her stepchildren call her their "Momala," and she maintains a good relationship with her husband's first wife, who was in the audience at the Sunday event. "We have a real modern family," Harris said, referencing the popular ABC sitcom. Harris even tried to make the work she does in the halls of the Senate sound cool. "I'm knocking on doors, and I get to this dude called Rand Paul," she says with laughter. "He's from Kentucky, he's a Republican. And I say, ‘Yo Rand, so I got this piece of legislation.'" She remembered a call she made to "check in" with Paul after an op-ed they authored together for the New York Times was published. "I need to check in with old boy and see how he's doing about this," she said, again with laughter. "I got in touch with him, I was like, ‘Hey man, how your people? You good?" The assessment by Harris that she needed to show more of a personal side was a good one. Starr Scesniak, a Los Angeles woman who came out to see Harris as she decides who she'll support for president, says she was worried about her inability to connect with her senator. "One thing I'd been worried about, in terms of my own connection to her, was that she hasn't shared much about her back-story," Scesniak said after the talk. "As much as we want to say that doesn't matter, it does." "She was here to bring the mask down and be a little more personable," Scesniak said. "I feel like I understand her a little better now." The repositioning didn't work as planned on everyone. Kim Rasser, who came to the event with Scesniak, understood what Harris was doing, but cautioned she was at risk of losing the edge she had over others in the field. "She was trying to get out from behind the badass attorney image, and relate a bit more," Rasser said. "But everyone knows her as a badass ballbuster, and I don't think she should shy away from it." "Her badassness is part of her likability," Rasser said. Scesniak, in the end, agreed that she liked her original view of Harris just fine as well. "We want a fighter, and women are comfortable with the fury," she said. "I'm cool with her having an edge." Rasser indicated her belief that a more effective way for Harris to become more relatable is for her to start speaking about issues people can relate to. "I think she has to get closer to what Elizabeth Warren is doing and speak more to the middle class and about income disparities," Rasser said. "I was disappointed she didn't talk more about it." Both agreed the "soft ball" questions from Wade made the event feel somewhat scripted, a sentiment shared by attendees at her first book tour event last week in Washington, D.C. That event was hosted by liberal Washington Post columnist Jonathan Capehart, who ended his event with Harris by having her read aloud a passage he had underlined in the book that she just happened to have committed to memory. The only real issue broached by Harris at length during her book events is criminal justice reform, a choice made because her career as a prosecutor has proved to be a liability with the progressive left. Even her most passionate supporters understand problems some on the left have with Harris's record on the issue. Maria Alfonso, who spoke to the Free Beacon after attending a meet and greet with Harris for her new children's book, said Harris shouldn't be blamed for "enforcing the laws" as a prosecutor but predicted her career would be an issue for her. "Kamala has my support, I've liked her since she was our attorney general, but a lot of people in the black community have problems with her," Alfonso said. "As the mother of a black man who can be shot by the cops any day, I obviously understand, but she was just enforcing the laws." Some of this anger showed up on her book tour—in San Francisco an audience member shouted at her from the balcony, "What about black people Kamala?" But if Harris's sole goal of her short speaking series was to come off as likable ahead of her coming presidential announcement, it was a success. "I wanted to get to know her better, on a personal level," Renee Crawford said after the event on Sunday. "If the goal was to make people like her, it worked on me." 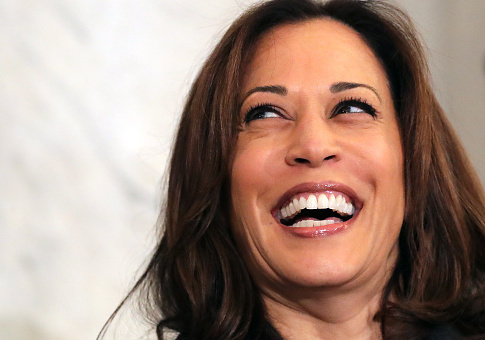 Harris is expected to formally announce her all-but-launched presidential run next week in Oakland. This entry was posted in Politics and tagged 2020 Election, California, Kamala Harris. Bookmark the permalink.